Welcome to our art glass studio. We're glad you're here! If you've got "sand in your shoes", sitting in our Beach Chairs is where you'll want to be. As you gaze upon this serene scene, you can almost feel a warm sea breeze and hear the gently breaking surf. 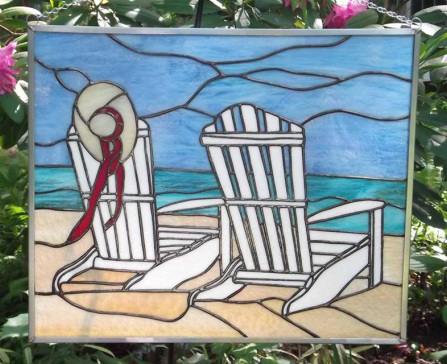 This stained glass panel is the perfect addition to any beach lover's home. Our Beach Chairs is signed and dated by the artist. Beach Chairs is just one of the pieces we would like to share with you. We create stained glass in many different sizes, shapes and prices. Please browse through all of our stained glass galleries to view our latest work.